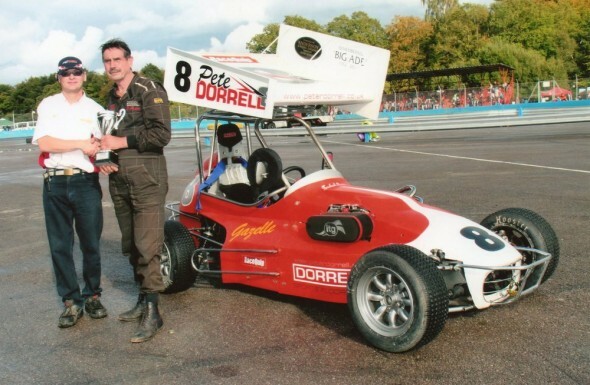 I thought my father-in-law Peter Dorrell deserved a mention. Pete raced F1s (375) from the late 70s up until the mid 90s. Then stepped back to let his sons race,Shane (371) and Clint (262). After a few years away from the ovals Peter decided he wasn’t quite ready to hang up the helmet and took a keen interest in Grand Prix Midgets. I don’t know if you’ve seen these but they are mega quick! We are all very proud of him, especially as almost 3 years ago Pete was gravely ill and we almost lost him, but not one for giving up easy Pete recovered and here he is winning a heat the same evening Sam won the ladies race! Not bad for a 67 year old! Well done Pete, keep up the good work!